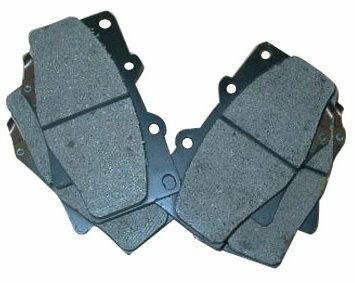 Brake pads are used to contact and apply pressure to the brake rotor to create the friction necessary to stop a moving vehicle. They consist of a metal shoe with friction material bonded or riveted to the metal shoe. The friction material is much more dense than the lining material used for drum brakes. This provides the brake pad with greater moisture resistance. The brake pads may be equipped with a wear indicator. This is usually a metal tab that will contact the surface of the brake rotor when brake lining has worn to minimum thickness. When the wear indicator contacts the brake rotor, it will emit a high pitched squealing noise that will usually diminish when the brakes are applied. The noise may be more evident during cornering as the brake rotor is forced into the wear indicator, due to the force of the turn. If this occurs, inspect the brake linings for wear immediately (or have your local auto repair mechanic inspect them), as this can help to prevent costly brake component damage from worn brake linings. The majority of commercial brake pads installed at auto repair shops are manufactured with normal, routine driving characteristics in mind (ie. normal city driving). Therefore, such “everyday” brake pads typically sacrifice higher end performance so as to provide longer life. While such brake pads are generally acceptable to the everyday motorist, they can possibly have dangerous consequences when used on high performance vehicles which endure severe operating conditions. I suggest that any driver who is looking for high performance brake pads (to reflect his high performance driving style), consider some of the following types/brands of brake pads. Most of these can be installed at a high performance auto repair shop. Compared to organic brake pads, ceramic brake pads are generally quieter and emit less dust. Most ceramic formulations have very low dusting characteristics, thus preventing dust from accumulating on your wheels. Since they were first used in 1985, materials that contain ceramic formulations have been recognized for their superior blend of traits. Instead of semi-metallics steel fibers, ceramic pads make use of the ceramic compounds & copper fibers. This allows ceramic brake pads to handle high stoppage temperatures with minimal heat fade, provide quicker recovery after a stop, and generate much less dust and wear on the brake pads and rotors. Futher, the compounds in ceramic brake pads make braking much quieter. This happens since ceramic compounds help dampen noise by generating a frequency that is beyond human hearing range. Ceramic pads will meet or exceed OEM standards for durability, stopping distance, and noise. According to most durability tests, ceramic compounds will extend brake life compared to most other semi-metallic and organic materials and will outlast other high-end pad materials by a measurable margin, with no sacrifice in noise control, pad life, nor braking ability. The best Kevlar metallic pads are Rotex brake pads, as many auto repair mechanics will attest to. Rotex pads offer superior stopping ability. The friction substance in the Rotex pads has Kevlar and metallic steel wire (+ sponge iron for maximum heat transfer), and silver virgin graphite for quiet operation. At a 60% metallic blend, it reduces vibration which causes squeal. Rotex brake pads are ideal for drilled rotors. Rotex brake pads are also probably the lowest dusting pads on the market. This is due to the Kevlar bonding material used in production of the pads. Rotex pads, on average, last last 30% longer than an organic brake pads. Rotex’s metallic content assures that a car will stop quickly, yet is made for the street so as to not be abrasive to the rotors. Rotex was first made for vehicles such as Mercedes-Benz and BMW so as to provide a brake pad with superior stopping power, but without all the dust that organic pads emit. Hawk brake pads are famous for their excellent stopping ability. Hawk brake pads are made from soft Ferro Carbon material and provide a high friction coefficient. Hawk pads make compounds that are excellent for the aggressive driver or driver who may have a heavy truck or SUV. Hawk HPS compound is popular for many vehicles because of its fade resistant formula, combined with low dusting compound. Hawk Performance HPS Road disc brake pads are designed for coupes, sports cars, sedans, trucks, and SUV’s used for high speed driving. Hawk Performance HPS Ferro-Carbon compound pads will provide advanced braking characteristics to enhance one’s road driving experience. This unique compound combines safety & quality of aerospace technology with the braking technology of motor sports. Hawk Performance HPS pads offer at least 20% more stopping power & much higher resistance to brake fade than many OEM or standard replacement pads.